Way better than the first one. Edgy & Thrilling. Sherlock Holmes is keeping is mind sane with Cocaine when Miss Morstan approaches him and Dr. Watson for a help in a case. Following the strange disappearance of her father, she receives a rare pearl as a birthday present each year. After years, the secret benefactor wants to meet her. Before the night is over, they find themselves in midst of a strange murder case, and a rare treasure. The story leads all the way to India and the first rebellion against the British Empire. The Sign of Four kept me on the edge, always fuelling and milking the excitement. Whenever you think the case is reaching an obvious conclusion, things explode. 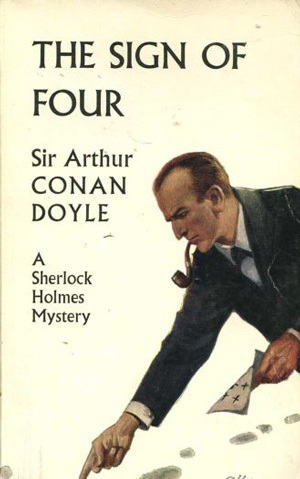 Conan Doyle turns ordinary into extra-ordinary. Like the first novel, The Sign of Four has an exotic back-story as well. And it’s filled with many stories of its own – of betrayal, human nature, luck and things one’d like to read about. But unlike the first one, it fits well into the main narrative, and makes for a perfect climax. Also, Conan Doyle uses ‘ejaculate’ less than the first one. Published on January 4, 2014. Updated on February 16, 2014.